Growing up, I was always a tomboy of sorts. I preferred to play with boys as a kid, I always wanted the "boy toy" from McDonalds, and I always preferred movies where the lead female was the hero rather than being a helpless princess. You can even see the difference in these pictures: the extremely fake smile that I had while dressed as a princess, compared to the one I was dressed as a cowgirl, taken either moments before or after. In Canada, our junior kindergarten school pictures were done in costume to be "fun" for young kids. I remember that day very specifically, because I wanted to dress as the knight, having picked that from the table of costumes. But I was told I wasn't allowed to because it was one of the "boy costumes," and they made me wear the princess one. 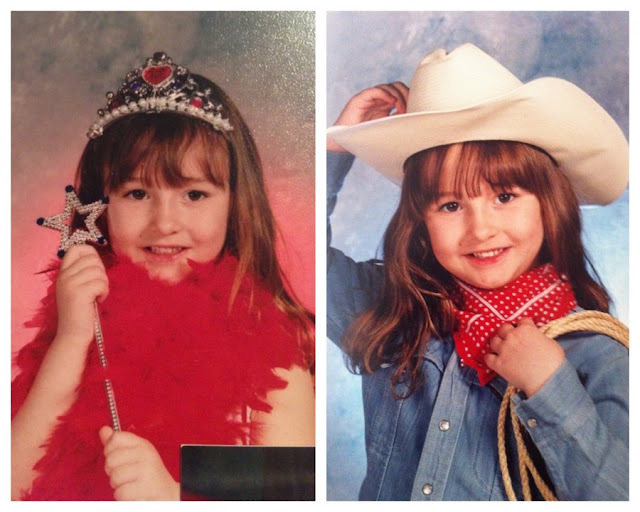 I was much happier with the cowgirl outfit, especially since "Toy Story 2" was one of my favorite movies. This was probably the first time I felt that society was telling me I couldn't be who I wanted to be. Thankfully, my parents didn't care how I dressed or what toys I wanted to play with when I was younger, proven to me more when I was 5 and I dressed as Spider-Man for Halloween. Luckily, my generation is growing up in a time where gender non-conformity is not that big a deal. When I eventually came out, my parents weren't too shocked and they accepted me wholeheartedly. I always find it funny to look back at these two pictures because it's very obvious which costume I was more comfortable in.